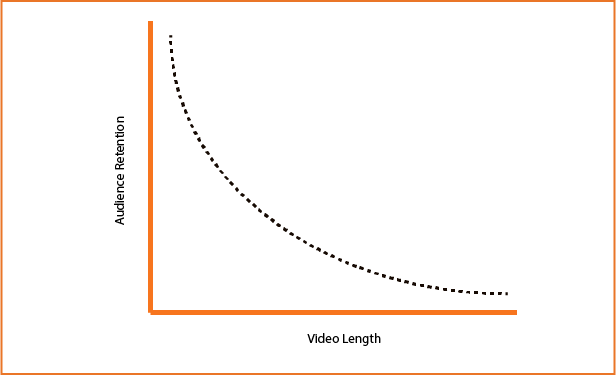 You’re likely familiar with the idea that a shorter explainer video length is generally better. That idea is based on the premise that short videos get straight to the point and hold attention better than long, dragged-out messages. The deficit of human attention spans has a direct impact on content and video marketing. Unlike previous decades where TV was the popular option, people are now free to check any online content with a simple mobile phone. Business owners have recognized this change and are producing videos with the mobile platform in mind. As a result, we are surrounded by great content and our minds find it hard to keep up. SumoMe looked at 650,000 sessions and found that 80% of Internet surfers don’t read articles from start to finish. In order for people to understand your message, you need to find an effective yet simple way to draw their attention. With that in mind, it is safe to assume there would be a significant correlation between explainer video length and view duration. We dove into our YouTube channel (which is 90% explainer videos) and collected analytic data throughout 2016. Check out the article to see what we learned! The majority of our explainers have different lengths. We wanted to find out if our viewers take video length into consideration when they decide to watch one of our videos and whether they have a good experience as the video goes on. We expected the audience retention rate to decrease for longer videos. The expectation was that 1-minute videos should have higher audience retention rates (not views) than 3-minute videos. Our channel has 584 public videos that have generated around 560,000 views at the writing of this blog post. 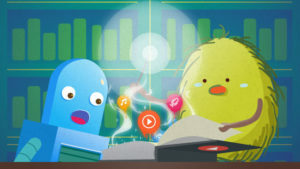 We believe that the results are representative of wider explainer video trends. How long should an explainer video be then? Our prediction was on point, although the graph isn’t a duplicate of what we predicted earlier. The sweet spot for an explainer clip is 1 to 2 minutes long. When the explainer video length reaches 2 minutes in duration, the average views drops from 77% to 57%, and that’s a significant difference when we’re talking about different types of explainers. There are a few important points that you can take from our research. 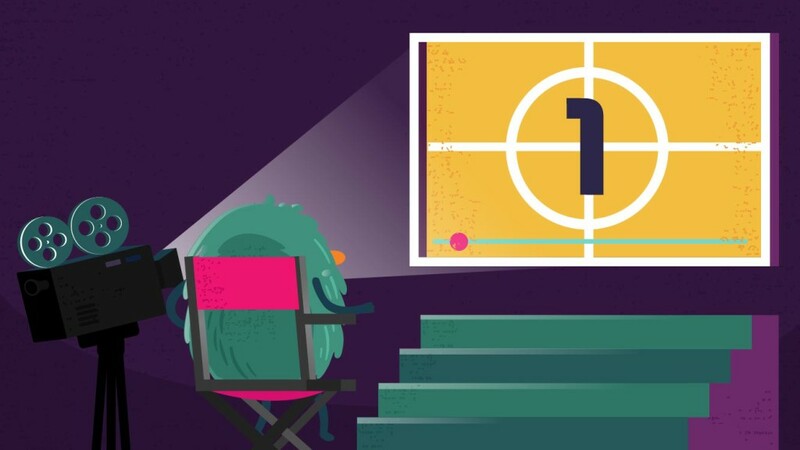 Animated videos shorter than 60 seconds have the highest audience retention rate. Explainers are meant to be compact and filled with bite-sized information for viewers. The data says the average audience retention rate of a 1-minute explainer video (or less) is 77%. It means that a 60-second video (on average) will hold viewers’ attention for roughly 47 seconds. After 3 or 4 minutes people will simply stop watching a video in question regardless of its quality. The audience retention rate gradually decreases as the explainer’s length increases. The longer an animated clip is, the fewer viewers it retains. After an explainer video length reaches the 2-minute mark, every second of it counts. 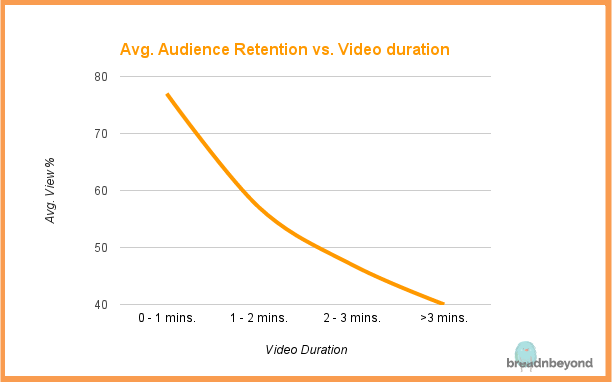 If it goes longer than that, it will likely have a negative impact on engagement forcing a person to close the video. So, we suggest that you avoid going past the 2-minute mark unless you truly have to and there is no other way to squeeze your content into the first 2 minutes. It’s best to search for a way to remove some of the resources and elements of the video. The acceptable average animated video length is anywhere between 1 and 2 minutes. Although the graph line seems to drop significantly after the first minute, 1 to 2-minute explainers is still powerful enough to get the most important parts of your content up-front. This is why most experts say that the perfect explainer video length should be around 90 seconds. The average viewer retention of a 1-2 minute explainer clip is 57%, which means that average viewers will receive half of your content. That’s why it’s important to plan your script before pitching it to an explainer video company. Explainers more than 2-minute long have only a 47% retention rate. After the 2-minute mark, exponential decay kicks in. The longer your explainer video length is, the less retention your video will have–and the difference is significant. The audience retention rate after 2 minutes dropped significantly. This isn’t to say that you should cut a 4-minute video down to 2 minutes. Some of your content might require longer videos. But the stats suggest that eliminating the last 30 seconds from a 2-minute, 30-second video will help keep retention rate high. In the end, you can sign in to your own YouTube Analytics account and check it yourself. What about videos more than 3 minutes long? 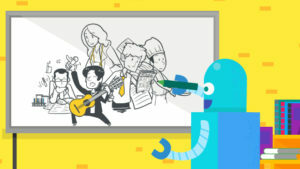 Just like a piece of writing, an explainer video should be only as long as it needs to be. Some people think that if you increase the length of the content, you are able to better explain the key features of a product or a service. Unfortunately, most people won’t get to a point where they start caring about what you have to sell. Animated clips beyond 3 minutes are likely to be a deep introduction of a product, a brand story or a very intense tutorial on how to use products or services. 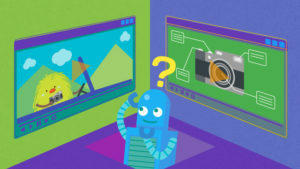 In such events, the viewers can expect a longer video, but it will no longer fall under the category of an explainer video. An animated explainer makes complex things simple by explaining product features to customers on your website. Dragging the explainer video length means making the information transfer more complicated. So make sure to choose simple topics which client can learn a lot about the shortest amount of time possible. 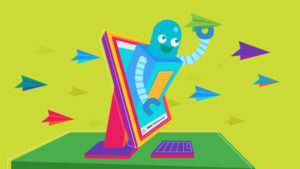 An explainer’s purpose is to explain a product, service, or virtually anything in bite-sized information. That means the shorter it is, the better results it will achieve (based on its essential purpose). Always remember that the length of an explainer video is crucial for your sales. If you manage to persuade a viewer to watch a video from start to finish, you will have better odds of telling your story, creating a connection to your brand and ultimately, forcing an action. If possible, squeeze your script into a 1-minute video. This time range has the best viewer retention. If you can’t keep it to 1 minute, try to keep it under 2 minutes. Three-minute videos can also work well if you’re able to create top-notch content. Try to compress video that is more than 2 minutes into 2 minutes.